The famous duo of Gilbert and Sullivan released their fifth collaboration, The Pirates of Penzance, in December of 1879. The opera proved highly successful and was performed around the world for well over a century. Probably the most popular version of the show is the 1981 Broadway musical, which won the Tony for best revival. Produced by Joseph Papp, it started Linda Ronstadt and Kevin Kline, and was adapted into a motion picture in 1983. 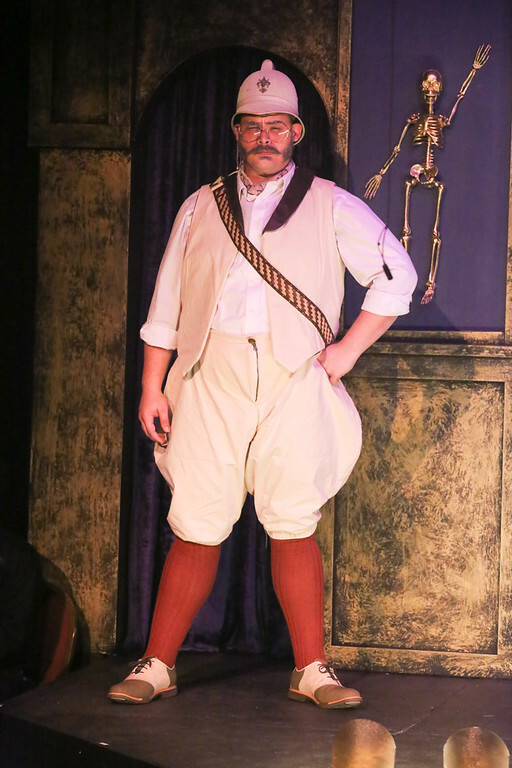 It was that production which Scott Miller fell in love with when he saw it pre-Broadway, and would later become the inspiration for his five-year-long labor of love writing his own new adaptation: The Zombies of Penzance. Co-directed by Miller and Mike Dowdy-Windsor, the show carefully and cleverly swaps out the pirate characters for the living dead. The changes are often subtle, yet completely change the subtext of the story. It’s amazing just how effective the changes are, while still paying tribute to the classic text. And Arthur Sullivan’s fantastic music is left unharmed, while meshing perfectly with the updated lyrics. The show follows the unlikely romance of Mabel (Melissa Felps) – the daughter of zombie hunter Major General Stanley (Zachary Allen Farmer) – and Frederic (Sean Michael) who is, in fact, a zombie himself. Meanwhile, the Zombie King (Dominic Dowdy-Windsor) reminds Frederic of his situation, and along with his undead companions (Kent Coffel, Robert Doyle, Matt Hill, Tim Kaniecki, Kyle Kelesoma) tries to make zombie brides out of the Major General’s other daughters (Mara Bollini, Lindsey Jones, Melanie Kozak, Sarah Porter, Christina Rios, Kimi Short). The Zombies of Penzance is absolutely hilarious right from the start. It’s the juxtaposition of zombies singing opera (and quite beautifully, I might add), and the subtle changes in dialogue which make it impossible not to crack a smile. The reworked plot is so absurd, but in the best way possible. Because of how the adaptation is handled with such care, the show is able to tell a just as entertaining and compelling story as the original. And I can honestly say I enjoyed it even more. The production features a tremendously talented cast, including many returning New Liners. Sean Michael (American Idiot, Out on Broadway), Dominic Dowdy-Windsor (Zorba, Yeast Nation), and Zachary Allen Farmer (Sweet Smell of Success, Bukowsical) are well-established and known for their voices. Charismatic newcomer Melissa Felps shines as Mabel, with a beautiful voice and great chemistry with Michael. 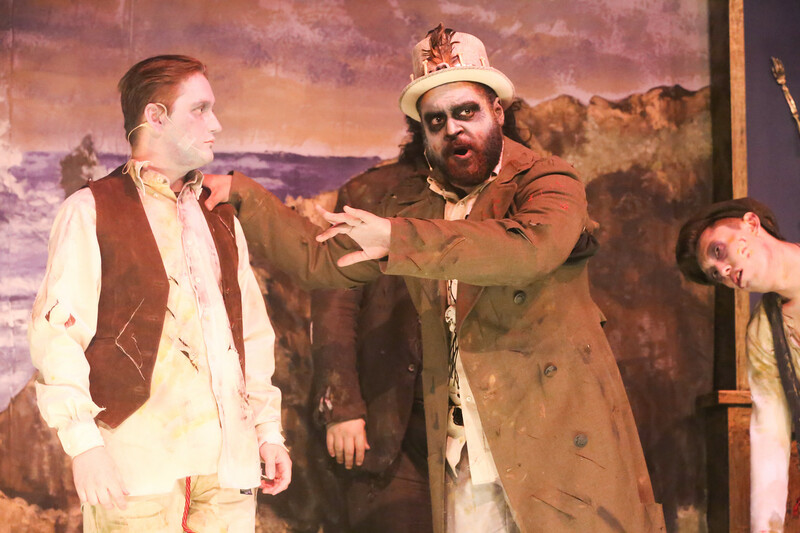 I was particularly impressed with Dominic Dowdy-Windsor’s ability to sing opera as the Zombie King. He sounded absolutely magnificent, in a style I’ve never heard him perform at New Line. His comedic delivery and ability to appear both intimidating and charming worked extremely well in the role. Farmer’s look and demeanor as the Major General are perfect. And he has, without a doubt, the most challenging number in the show – “Modern Era Zombie Killer” – which is, of course, a play on the “Major-General’s Song” from Pirates. Not only is the speed at which he sings commendable, but he has to remember all of the minor differences between this show and the original (not to mention re-writes that happened since the reading earlier this year). The song is an absolute riot – so funny, and mind-blowingly impressive. These lyrical changes got a big reaction out of the audience, and deservingly so. The cast is largely comprised of zombies and the Major General’s daughters, and they are all terrific. For much of the show, they are singing, dancing, and hiding among the audience. It is such a fun experience to have Kent Coffell (Zorba) and the other zombies running up and down the stairs, while chasing Kimi Short (Lizzie), Sarah Porter (Anything Goes), and the other daughters around the theatre. The New Line band, directed by Nicolas Valdez, has never sounded better. They do such beautiful justice to Sullivan’s wonderful orchestrations, creating the perfect atmosphere for the wildly entertaining show. 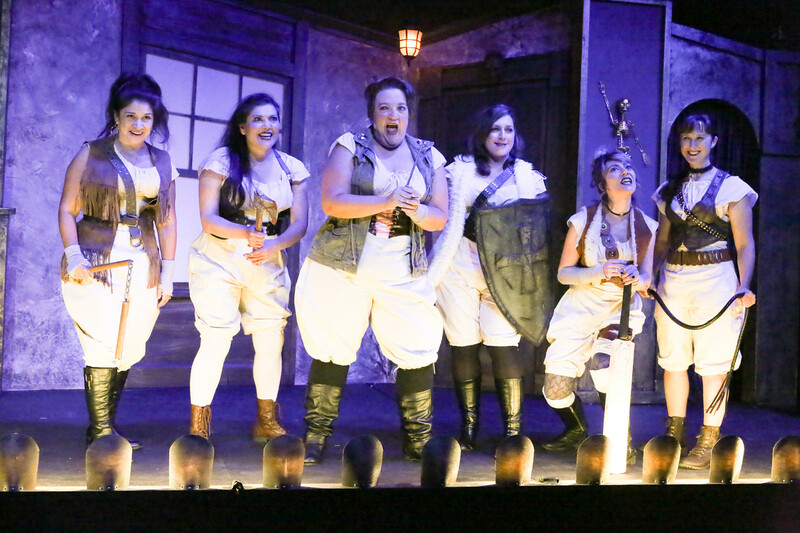 New Line Theatre has chosen the perfect musical for the Halloween season, after carefully incubating it with love for several years until it was ready to make its debut. The Zombies of Penzance will change the way you think about the music and characters forever, as its updated message of female empowerment and inclusivity is undeniably relevant today. 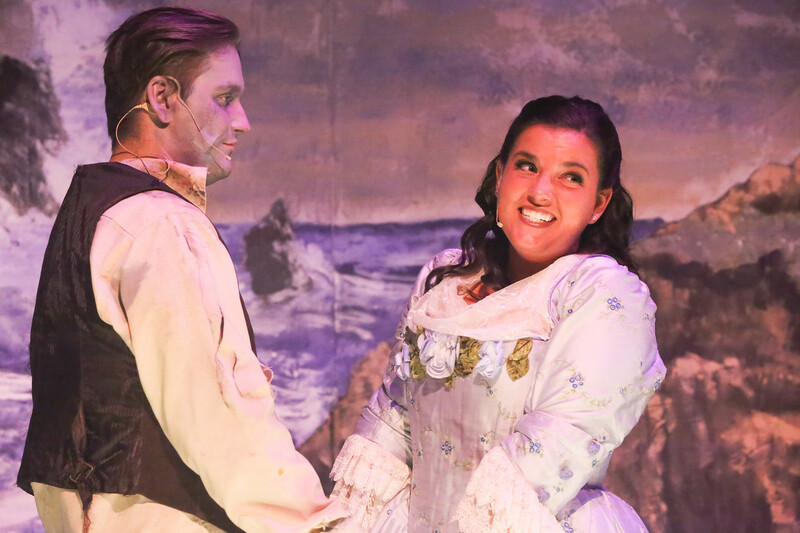 The show is so much fun, and there is much to be appreciated by both fans of Gilbert and Sullivan’s original work and newcomers to this fresh new story. 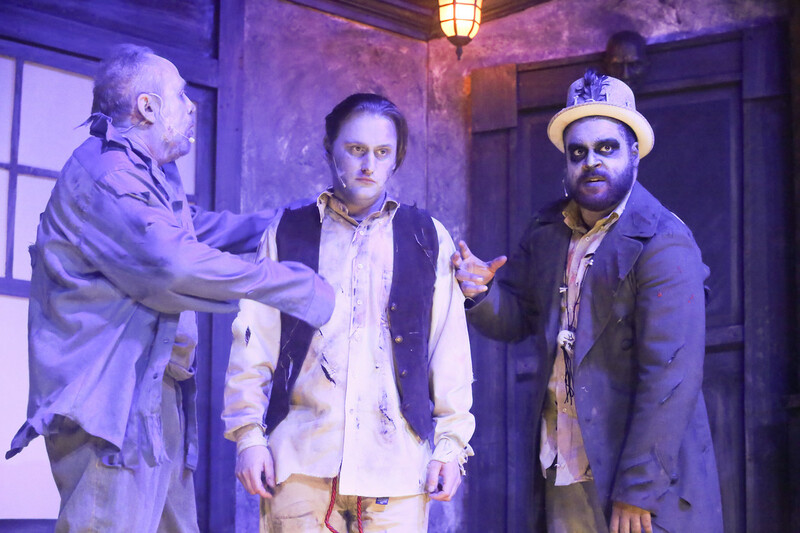 See The Zombies of Penzance now until October 27 at The Marcelle! Tickets range from $12.50 – $30, and are available via MetroTix. For more information, visit newlinetheatre.com.